Ocean and sound views galore. In the morning surfers can check the ocean from the kitchen table. In the evening the sunset over the sound lights up the whole house. Just a short walk to the beach, then come back and enjoy the pool and hot tub. If you’ve had enough of the sun, relax on a comfortable sofa with the company of our 46 inch flat screen tv on the 3rd floor or shoot some pool, foosball, or bumper pool in the game room. This house is perfectly located near the best surfing spots on the east coast and is fully equipped to meet all of your comfort and entertainment needs. This house is ideal for large groups in need of bunk beds and is loaded with amenities! Perfect for church or business retreats, reunions, fishing, or surf trips, and large-family getaways. Very kid and adult friendly. The first level features a fully stocked game room in including a billiard table, rené pierre foosball table, bumper pool table, wet-bar/ mini kitchen with extra freezer, and a sitting area with a flat screen tv, as well as a bedroom with a pyramid bunk-bed, a full and half bathroom, and fully equipped laundry room. The second level has four bedrooms each containing two sets of bunk-beds, one of which is a pyramid (double on bottom). 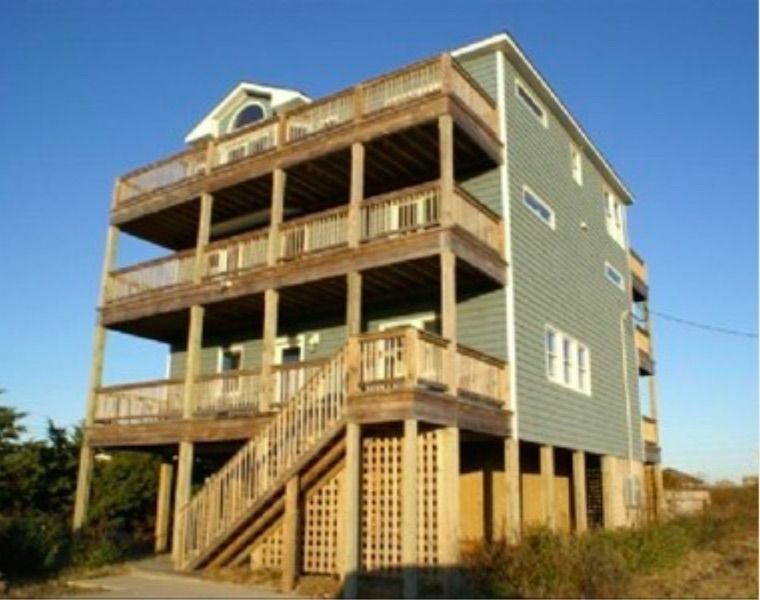 Each room has its own deck access with views of the sound or the ocean. Head on up to the third level and you will find a spacious living area with a large sectional sofa, 46 inch flat screen tv with blu-ray player and surround sound, a solid mahogany dining table that seats 16, the master bedroom, a stylish kitchen with stainless steel appliances, as well as another closed-off playroom or office for those in need of some privacy. Maximum number of occupants is 15. Minimum age for responsible party is 25.